Every time I have the privilege of viewing an exhibit of contemporary artwork by Native American artists, I wonder why I don’t see more. I suppose there are Native Americans who produce schlock, but I don’t recall ever seeing a single piece. The current exhibit at the Ucross Foundation Art Gallery is no exception. Every single piece, drawn from the collections of Jordan D. Schnitzer and His Family Foundation, is compelling and executed with technique, thought and verve. 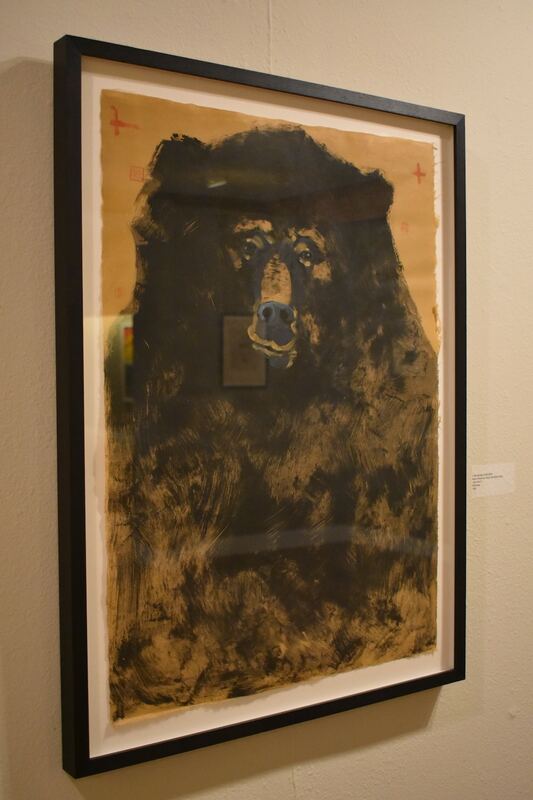 “Bear” by Rick Bartow was perhaps the most compelling piece in the exhibition for me. It’s a monoprint, very brushy, which gives the impression of stiff fur. The artist uses the warm gold color of the paper for the lighter areas of the face, fur and snout. His snout is further enhanced by touches of gray or white which give it just enough definition. His expression is solemn — the knowing expression of wisdom tinged with sadness. His eyes seem nearly human as they gaze out from the paper; but what strikes the viewer is the intelligence expressed in his eyes. So often wildlife is just for show and we miss the personality of the animal. This rendition of bear reminds us that animals have intelligence and knowledge beyond humans, but which might be accessible to humans with enough attention. The piece is finished with several Chinese chop marks floating around his head and crosses, hastily painted in red, above the corners of his ears. The strokes of the brushes are confident and fast, just as they are in his other two pieces. Rick Bartow’s “Raptor” uses green finger smears for feathers. Symbols appear carelessly scribed into the ink. The bird again demonstrates an intelligence that cannot be denied as it peers at you over its sharply curved beak. Support the the arts. Become a member today. “Coyote” is a drawing, all sharp almost burned lines, very spare. His mouth is open, ears are up and his eyes are outlined almost as if he wears glasses in this portrait. He seems a bit sinister, and certainly very determined. Another instance of a determined coyote is Juane Quick-To-See-Smith’s “Sinchlep turned the Giants into boulders”, which is part of a series of intimate black prints on cream that seem to have come from a portfolio or book. Again, the piece is made of simple lines but in this case, far more stylized and outlined with thick black lines to differentiate him from the landscape, although the lines are of the same type and quality. Sinchlep is nearly human in his stance. Behind him is a tall boulder, presumably one of the giants. 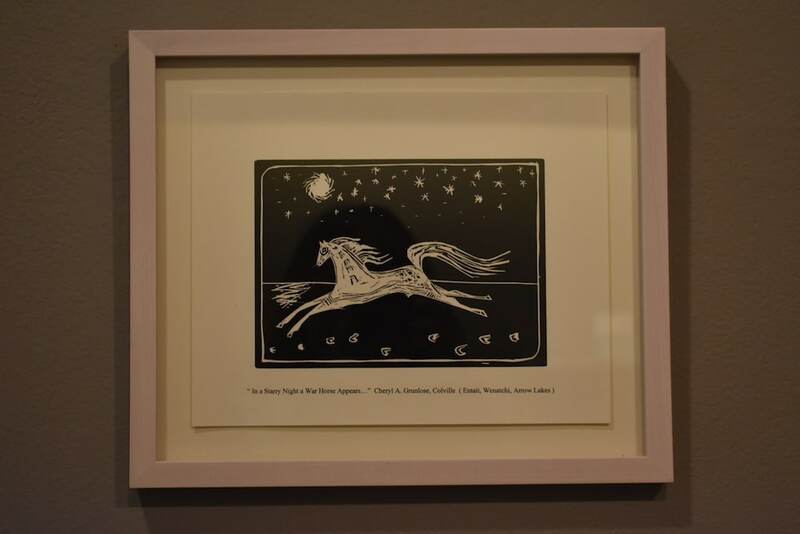 Also in the series, Cheryl Grunlose’s “In a starry night a war horse appears” depicts a stylized, almost folk arts horse, decorated and leaping across the earth, stars and the moon above. Below, moon shine on the ground and more hoof prints that one might think possible. Very simple mark making which provides just enough context to understand the piece. 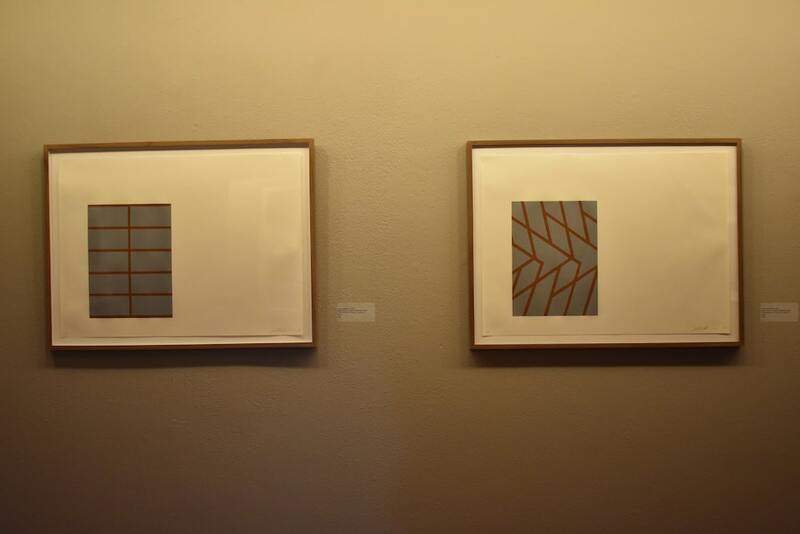 Joe Feddersen’s three prints are stripped down to the bare minimum. Simple geometric lines, precisely printed, inspired by the urban landscape: a herringbone floor, a parking lot, tire tracks. As the curator of the exhibit points out, artists develop their own language from the landscape around them. Here, he uses the urban landscape as nature, which also mimics to an extent more traditional patterns like those found in baskets. James Lavadour’s big pieces are pattern via repetition. 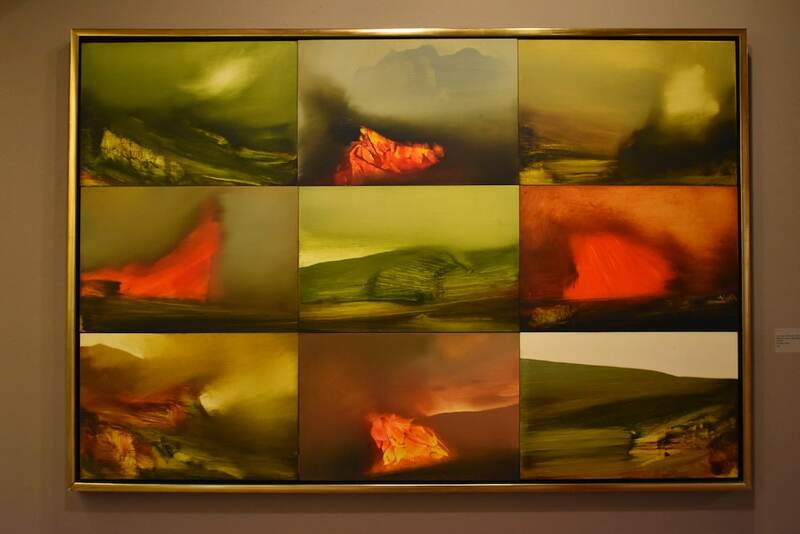 “Untitled” has four red panels, the red of fire or volcanic eruption. I immediately think of Mount St. Helens. The other five panels are greens and browns. Sole painting in exhibit? It’s almost as if the artist peered inside the mountain and then took down the power of the lava flow in rushed impressions. The sky in most is obscured with gray and brown and in one it looks like the ash is blowing. This is, of course, only my interpretation. 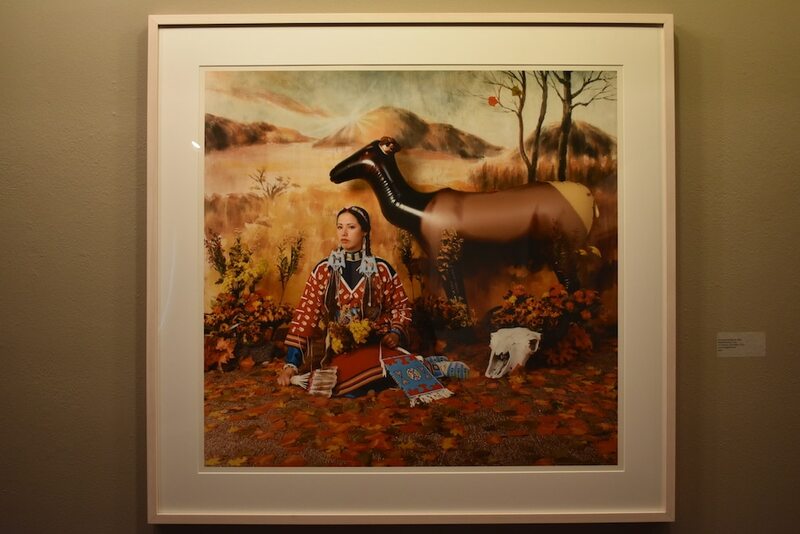 Four pieces by Wendy Red Star, one for each season, are included in the show. Each one demands attention to truly understand what is happening. The landscapes are obviously fake, with a feel of 1950s imagery, or maybe a poster that comes in a magazine. Two even have fold lines. They are idealized Gardens of Eden with perfect mountains and flowers or snow or leaves depending on the season. Each includes a skull of some kind. Blow-up and cheap ornaments abound. Subtle bits of tape hold the parts of the collage together, adding to the sense of something being created out of other things. These digital collages include self-portraits of the artist in full regalia set into the fake landscape. The artist looks at the viewer solemnly, asking us to consider what a “real” Indian is doing lingering in such a landscape. And yet, isn’t this a parody of how Europeans have considered Native Americans since the beginning? Romanticized Native Americans and the western landscape. Imagined them riding around in gorgeously beaded leather in a landscape that gives all. Red Star is only taking it to the next level. Linda Tesner, a Portland-based curator and writer, provides excellent interpretative information to help navigate what you see. Each of these pieces, and the others in the show, offer layers of meaning and symbols which intrigue the viewer who is willing to spend the time to unearth them. Wildlife, Pattern, and Identity: Contemporary Native American Work From the Collections of Jordan D. Schnitzer and His Family Foundation is on view through October 1 at the Ucross Foundation Art Gallery. Camellia El-Antably is a visual artist and co-founder of Clay Paper Scissors Gallery in Cheyenne. She curates the Studio Wyoming Review.